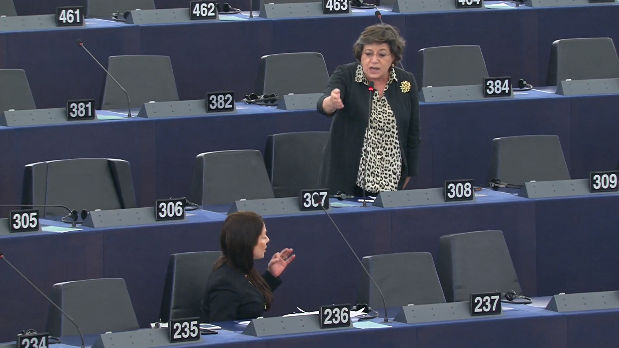 Portuguese MEP Ana Gomes told the European Parliament on Monday that it was unacceptable how Prime Minister Joseph Muscat “continues to protect [Daphne] Caruana Galizia’s murderers”. In a lively debate about a resolution on the rule of law in Malta and Slovakia, the firebrand socialist MEP slammed the Maltese authorities for failing to arrest the people behind the journalist’s murder. Ms Caruana Galizia was killed by a car bomb in October 2017. Two months after the murder, 10 people were rounded up and three of them were charged with setting off the car bomb. The other seven were released without charge. Prime Minister Muscat told journalists last week that charges would only be brought against more people allegedly involved in Ms Caruana Galizia’s assassination once enough evidence was secured to ensure a successful prosecution. The resolution about Malta urges the European Commission to enter a dialogue with the government in the context of the rule of law framework, a three-stage process whereby Brussels issues an assessment, makes recommendations and monitors the member state’s follow-up. Nationalist Party MEP Roberta Metsola said the resolution defended the values espoused by the Maltese people. She said the resolution provided a framework on how to continue defending these values. “As a representative of the people of my country I must, I will, defend those values,” she said. Malta has already been on the receiving end of an opinion by the Venice Commission, highlighting deficiencies in its institutional set-up. The request for the review by the EP committee was submitted by Dutch MP Pieter Omtzigt, who is preparing a report about the assassination and the rule of law in Malta. In response to the Venice Commission’s recommendations, it was announced last week that the government would be splitting the Attorney General’s role, with the setting up of a separate prosecutor’s office. Labour MEP Miriam Dalli pointed out that the resolution made no mention of the government’s commitment to these changes. She said further reforms, neglected by previous conservative administrations, required a two-thirds majority in government. Fellow Labour MEP Alfred Sant said Malta fully respected the rule of law. He said issues about the rule of law were being used to advance what he termed as “polarised and biased interests” arising from national politics. “Factually incorrect and skewed accusations are being made about Malta, so that so-called inquiries could be launched. Repeatedly, investigations of this type seek to tarnish the image of the island,” Dr Sant told the European Parliament. EU Justice Commissioner Věra Jourová said the Commission used all the tools available to it when faced with rule of law issues. She cited recent action against Poland and Hungary as evidence that the Commission was willing to get tough with violators. The EU Commissioner expressed her agreement that dialogue with Malta had to continue. She said the Commission had highlighted its concerns about the “lack of efficiency” with which corruption cases were investigated and prosecuted. A final vote on the rule of law resolution, which among other things call for a public inquiry into Ms Caruana Galizia’s death and publication of the Egrant inquiry, will be held on Thursday.